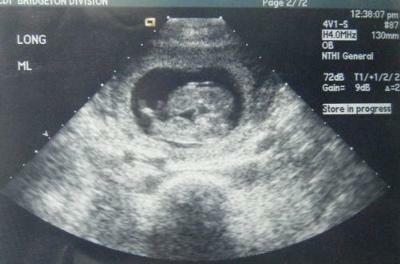 I was 11 weeks at this ultrasound and in shock as they told me there were two babies in there. The last thing I expected was to be pregnant because I had two miscarriages in six months. I'm so excited to have two, but really nervous something will go wrong. Just trying to think positive. hello. i have had two miscarriages in the last 2 years. i am pregnant once again. ill have to upload my ultrasound at 6 wks.. i go again this fri... congrats! Ah just read up on what mono-mono twins were! Is that what identical twins would look like? My twins look very different in their 7w u/s. Two sacs, two babies. I see one sac and one baby? I'm curious because identical kids would be so strange for me to have! Thank you I know it will and it gets better with every kick I feel. I hope everything goes okay! I had 2 miscarriages before this pregnancy as well. This looks exactly like my ultrasound! I am 12 weeks pregnant with identical twins, assumed to be mono mono. How far along are you now? I am 26 weeks pregnant with B/G twins. I too have had previous miscarriages and was surprised that we are having twins. I know how you feel and you think that everything that can go wrong will. My husband calls me Parinoid Jennifer but I can't help it. I had to have a cerclage but everything is going good so far I just pray everyday. I am sure that you will have a great pregnancy and once your in the second trimester which I think you are in, it gets much better!!!!!! Think positive!!! Most of all congrats. I am 33 weeks pregnant with B/G twins. Had a previous misscarriage....but Im blessed with 2 now. Take care of yourself...They soon to be here and yet be beautiful healthy little miracles!